This shared tree is heavily DoT based, with some lousy burst, but great sustained DPS and maneuverability. This is arguably the best spec for overall damage capability, thought some would say that the dependence on DoTs puts you at a disadvantage when facing healers with cleanses etc. Several of a Gunslinger’s normal skills in particular get multiple buffs. Thermal Grenade: The talent Bombastic is used in a lot of hybrid builds for the damage it brings in AoE situations. Escape Skills: There are a bunch of escape skills that get buffed by the talent Hold Your Ground, which lowers the cooldown on Escape, Defense Screen, and Pulse Detonator. Another cool aspect of this tree is the addition of a new escape skill in Surrender, which can remove all movement-impairing effects with the talent Dirty Trickster. This is one of those skills that is always on cooldown in PvE, but is rarely used in PvP because all it does without this talent is reduce threat, which has no meaning in PvP. Hemorrhaging Blast: Increases the damage done by your next 10 DoTs. Costs no energy. Hightail It, the new level 51 skill, gets a buff with the talent Incendiary Mine. It drops an AoE DoT/slow where you began the roll. Flurry of Bolts and filler skills until Wounding Shots is up again. For filler skills, I use Thermal Grenade and Charged Burst, sometimes adding in Speed Shot or Aimed Shot if I have the time. Your best defense is good mobility. Make sure you avoid getting leaped to in precarious situations (like Huttball). Use Cover when using Wounding Shots so you can’t be interrupted on your best skill. Try to DoT people up then LoS them. Dirty Fighting has a lot of flexibility when it comes to the synergies that work well in this tree. There are people who don’t even feel that the Tier 8 skill is worth taking! I personally like to consider a true Dirty Fighting build as one that goes up the whole tree to Tier 8. There are basically 28 talents I have to have in my builds that use all of Dirty Fighting. I. No Holds Barred (3/3) – Increases crit chance by 3%. This is important in this spec, as later with the talent Fighting Spirit, we will need crit to regain energy. I. Holdout Defense (2/2) – One of my favorite talents, this grants Blaster Whip a 50% speed boost after use. This is great for the mobility that comes with this tree. II. Mortal Wound (2/2) – Makes Vital Shot have a 25% chance to tick twice, which seeing as a lot of your damage comes from Vital Shot, is a good thing. II. Open Wound (1/1) – Again, this buffs Vital Shot by increasing its duration by 3 seconds. Helpful in maintaining DoTs on multiple targets. III. Shrap Bomb (1/1) – This is your other big DoT, and this sucker is an AoE with no cooldown. If you add the talent Feelin’ Woozy, you get a slow from this too. III. Bombastic (2/2) – Buffs the damage of Shrap Bomb and Thermal Grenade. Obviously we want to buff Shrap Bomb. III. Cheap Shots (2/2) – This buffs Wounding Shots by 6%. It does other things too, but that is why we like it now. IV. Fighting Spirit (2/2) – This talent is essential for good energy management, as every crit will produce 4 energy. Also reduces the cooldown on Cool Head by 30 seconds. IV. Black Market Equipment (1/1) – Increases the crit chance of your DoTs by 12%. Heck yes! More DPS, and with Fighting Spirit, more energy! V. Wounding Shots (1/1) – Ranged skill that scales in damage with more DoTs. I loved this skill already, and it just got better with the addition of Dirty Shot (see below). V. Reopen Wounds (2/2) – Increases crit chance of Wounding Shots by 8%. Yay more damage! VI. Cold Blooded (2/2) – Increases damage done by DoTs on targets under 30% health by 15%. It is always fun to see that damage accelerate when the enemy is low on health. VI. Nice Try (1/1) – An absolute must in PvP. This gives a 15% damage reduction to incoming DoTs, as well as giving your DoTs the ability to reapply their effects at a weaker strength when cleansed or expired. This allows you to still use Wounding Shots to its full effectiveness if your DoTs get cleansed. VII. Dirty Shot (3/3) – Increases Wounding Shots damage by 3% and makes Wounding Shots have a 45% chance to reset the cooldown on Quickdraw and make it usable on any target at any health level. VII. Incendiary Mine (2/2) – Increases the duration of Dodge by 1 second, but also gives Hightail It the ability to drop an AoE DoT where you roll from that slows people. Great skill all-in-all. VII. Hemorrhaging Blast (1/1) – Increases the damage done by your next 10 periodic effects. Oh yeah, and it’s free. I. Black Market Mods – Increases Alacrity, which while a good stat, especially since 2.0, it is not always worth prioritizing. II. Flash Powder – This makes Flash Grenade decrease Accuracy by 20%. Situational at best, considering how many classes value Accuracy. II. Dirty Escape – Great cooldown reducing talent for Dirty Kick. Can be good for PvP, but not as much for PvE. IV. Feelin’ Woozy – Makes Shrap Bomb slow targets by 30%. This is great for some situations, not for all. IV. Hold Your Ground – Reduces cooldowns on Escape, Defense Screen, and Pulse Detonator. In PvP, absolutely take this skill. In PvE, you can probably skip it. V. Hotwired Defenses – Defense Screen shields for 30% more damage. This is not a 30% more defense period, but rather 30% more of what Defense Screen already did. I like this talent for PvP, but it might be more situational in PvE. V. Dirty Trickster – Surrender cleanses movement-hindering effects. Great for mobility, but not necessary all the time in PvE. VI. Concussion – Makes your bleeds not tick on targets affected by your sleep effects (i.e. Flash Grenade). This is great for PvP, not for PvE. This build focuses on some of the more defensive skills in the Dirty Fighting tree, while still maintaining a level of DPS that this build can bring. Along with the core skills, it takes Hold Your Ground for the defensive skills cooldown reduction, Hotwired Defenses for the Defense Screen buff, and Dirty Trickster to help move out of the fire. From Saboteur, we take Bravado because more energy in this spec is a good thing, and Streetwise for the Cunning boost. Alternatively, if energy is not an issue, then you would swap Bravado for even more defense with Cool Under Pressure which will heal you while in cover. From Sharpshooter, we take Steady Shots for the additional boost to Wounding Shots, which is one of the main damage-dealing skills in this spec, and Ballistic Dampers for the 30% damage-reducing shield. This build capitalizes on the ability to debuff multiple targets with slows and Accuracy debuffs, and it can also help healers by making your Flash Grenade usable on targets with your DoTs on them. Essentially, this build (along with the core talents) takes the talents that buff Flash Grenade. From Dirty Fighting, we take Flash Powder for an Accuracy debuff and Concussion so we can use it on targets that have DoTs on them. From Saboteur, we take Bravado and Streetwise for reasons mentioned earlier, and we also take Saboteur’s Utility Belt for a lower cooldown on Flash Grenade. From Sharpshooter, we take Steady Shots for a buff to Wounding Shots, and we go ahead and use our last point on Ballistic Dampers to help the healers during difficult situations. Flash Grenade should now be available for most waves of multiple enemies that might flock to a healer, DoTs from you won’t break the CC, and even if the CC does break, it will debuff their Accuracy making them less powerful against their next target. Why anyone would want to level in Dirty Fighting is beyond me. It is primarily geared towards slow ramped-up damage that tends to be too slow for everyday mob grinding. But if someone were to want to level in this spec, here is what they should do. I will include the final spec before each respec, since there are so many respecs I would do here. At this point, it is a long crawl up to Dirty Shot, which is the best talent you’ll get until Hemorrhaging Blast. For a while, switch over to Saboteur for an AoE damage boost. Personally at this point, I would evaluate your damage and survivability. Do you need more longevity in the battleground? If so, take Hotwired Defenses in Dirty Fighting. If you need more damage, go for either Steady Shots in Sharpshooter for a little bit more power to Wounding Shots or put two points in Independent Anarchy for a damage buff to Thermal Grenade, which is already getting a lot of love with your spec. After this, head back over to Saboteur and pick up the talents mentioned earlier, with one caveat. When you get to level 51, respec and trade Flash Powder for Incendiary Mine, since you now have Hightail It. Snag Steady Shots from Sharpshooter (whoo alliteration). That leaves you with one point. I would put it in Ballistic Dampers. I don’t really care what you do, because let’s face it, you made it this far leveling in Dirty Fighting. You are obviously fond of pain; you probably will do fine sticking it wherever the heck you want. It is just one point anyway. 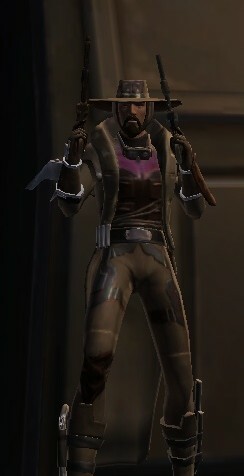 This build is the ideal of what Dirty Fighting is to the Gunslinger: the most mobile build there is. Everything from Holdout Defense, to Hold Your Ground, to Dirty Trickster, to Feelin’ Woozy, to Incendiary Mine screams “get out trouble!” Basically, this is THE quintessential run-and-gun build for the Gunslinger. From Saboteur, we take Streetwise (because stats matter at level-cap) and Bravado for the endless energy. We top it off with Saboteur’s Utility Belt for more AoE goodness on the run, plus we can use Flash Grenade to help us kite. For those of you who actually like the Cover mechanic and would like a spec that is a little more defensive, this spec is a pretty good choice. It is kind of like my Run-and Gun Sharpshooter build; it is trying to do something another spec does better. I figure it is better to try to adapt a spec to a playstyle, rather than the other way around. For this build, we take things that give us survivability and distance from our target. We assume that you will be in the back, staying in cover and not moving. Things like Flash Powder and Concussion allow us to create distance between us and attackers. In Saboteur, I take all of Streetwise and Cool Under Pressure, but I only put one point in Bravado so we can have 4 extra points for the Sharpshooter tree. In Sharpshooter, we take both Ballistic Dampers for when the enemies figure out where you are, and we take Steady Shots for the sustained DPS. This build buffs Thermal Grenade in several ways, as well as keeping Wounding Shots. Defense Screen also becomes quite good in this spec. This build splits between Dirty Fighting and Saboteur, 0/21/25. From Dirty Fighting we take standard talents up until Reopen Wounds, and additionally we add in Hotwired Defenses (which will come into play later). It may seem odd for me to include Streetwise in the chart, but Cunning affects Bonus Healing, which in turn affects how much Defense Screen absorbs. Good job. Great and interesting read.